Welcome to the Adirondack communities of Old Forge and Inlet, New York. Come visit us Thanksgiving weekend to kick off the holiday season with friends and family. Area clubs, civic groups and businesses have planned an unforgettable family experience. Santa, Mrs. Claus and their reindeer will be in town and families will be treated to old fashioned horse-drawn wagon rides, face painting, caroling, tree lightings, a light parade, Zoo Mobile, Moose River farm animals and book signing, pictures with Santa and Mrs. Claus and more! All free of charge! Additional venues are also available for your enjoyment. 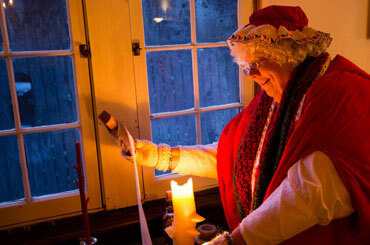 Including the Santa Express Train, holiday arts and crafts at View. The Reindeer Run, a fun run for kids of all ages, takes you from the Goodsell Museum (Historical Association) to the busy corner. Keep your antlers on, the fun doesn't stop there -- wear your antlers into the special holiday 2pm matinee at the Strand Theater and receive a free small popcorn and 1/2 price matinee.